IT’S not surprising that, according to Hagerty’s classic car valuation, the BMW 3.0 Coupe has appreciated in value by over 40% in the past decade — and by nearly 20% in the past three years alone. What’s surprising is that the car, manufactured from 1971 to 1975, was slow to begin its spectacular ascent. Those days are long gone. In today’s heady collector car market, an average BMW 3.0 CS or CSi will cost over three times that amount. (The “i” in the latter name indicates the presence of a more potent system for delivering fuel to the engine.) And the ultra-rare, lightweight CSL models, with their alloy body panels and acrylic side windows, can approach US$150,000 (RM543,000). One look at the car explains its appeal. It has the long hood/short rear deck proportions that define a classic coupe, and it bears elegantly understated detailing such as the chrome trim lining its mid-section and surrounding its windows. All four windows retract, which lends excellent visibility and a convertible-like feeling inside. The model was one of the first times the marque used the now immediately recognisable BMW twin-headlamp and twin-kidney grille face. 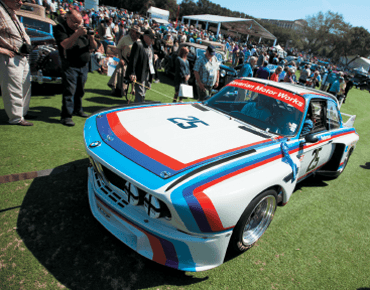 So lovely was the 3.0 Coupe that when BMW started its famed Art Car programme — commissioning renowned painters to create custom works on their vehicles — the first cars chosen, as templates for works by Frank Stella and Alexander Calder, were 3.0 Coupes. Meant to rival the dominance of the era’s contemporary Mercedes coupes and sedans, the 3.0 Coupe helped define the Bavarian brand’s unique selling proposition: that it offered a more sporting and engaging form of luxury. To this end, BMW built a powerful and smooth revving straight six-cylinder engine — another hallmark that’s continued to this day — into its forward-canted prow. It was good for a top speed of over 200kph (128mph). Inside, the coupe seated four comfortably, providing such accoutrements as power windows, air conditioning and leather seats. It is also a very adult vehicle. The 3.0 is not a hot rod or a muscle car but a stately Grand Tourer, meant to be piloted along twisting coastal roads en route to a weekend getaway. It is exhilarating but never dangerously fast — well planted, yet never punishingly firm in its ride. And it makes mechanical sounds that are wonderful, but never intrusive. As wonderful as these cars are to look at and drive, and as much as they seem a great bet for further escalation in value, they do not come without hazards. Foremost is rust. The contract for the 3.0 Coupe’s handsome body was farmed out to famed German coachbuilder Karman, and many of the unseen seams of the vehicle have a propensity for rot. Our friends at Hagerty once described the 3.0 Coupe’s sensuous curves as, “one of the prettiest ways to creatively trap moisture ever devised”. This article first appeared in The Edge Financial Daily, on February 26, 2015.